Listen, O daughter, behold and incline your ear, And forget your people and your father’s house; For the King desired your beauty, For He is your Lord… All her glory as the King’s daughter is within, Adorned and embroidered with golden tassels. The virgins behind her shall be brought to the King; Her neighbors shall be brought to You; They shall be brought with gladness and rejoicing; They shall be led into the temple of the King. St. Mary gave birth to the True Word, the Son of the Ever-existing Father, who came and redeemed us from our sins. She is the handmaiden and mother (Luke 1:48), the Virgin and the heaven, who carried in the flesh He who sits upon the Cherubim. It is through Mary that the One without flesh was incarnate, and the Word took body; it is through her that the One with no beginning began, and the Eternal One became temporal. It is through her that the Incomprehensible has been touched, and the Unseen has been seen, and the Son of the Living God became the Son of Man. He who existed before all the ages came and was incarnate of her, and the Ancient of Days came out of her womb. She held in her arms the One who gives food to all flesh, and she nursed the Provider of everyone. It is for this reason that St. Mary is honored more than any other created being, in heaven or on earth, and is commemorated several times throughout the year. The Consecration of the First Church Built in Her Name in the City of Philippi: 21st of Paone (28th of June). On this day we also celebrate the feast of her miracle of dissolving the chains of St. Matthias the apostle. 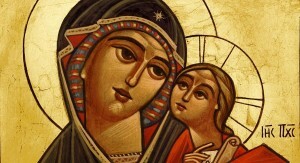 In addition to these five feasts, there is a monthly commemoration of St. Mary on the 21st of every Coptic month. 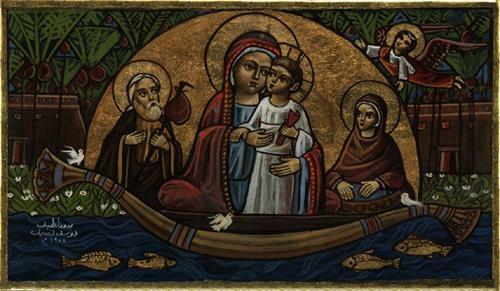 The Church also celebrates the annunciation of her birth to her father Joachim on the 7th of Mesore (13th of August) and her appearance in Zeitoun upon the dome of the church named after her on April 2, 1968 (24th of Paremhotep). St. Mary became great through her service and her quietness. She always put God first and that is why she was always willing and ready to serve others. At the Annunciation, St. Mary did not even give herself the legitimate right to stop and think about this manner of conception planned by God, foreign to the natural course of things and which could possibly have jeopardized her family name and consequently ruined her life. The humble St. Mary did not question the role destined for her, but replied that she would willingly serve as the handmaiden of the Lord, with no excuses. Immediately following her acceptance of the Annunciation by Archangel Gabriel that Mary would give birth to the Son of God, she left her home and went to serve her elderly relative, Elizabeth, whom she had learned was also going to have a son. Throughout her life, she continued to serve her family and those around her. We can see this in her Son’s first miracle, changing the water into wine at the wedding at Cana of Galilee. Without waiting until someone asked for help, she noticed their need and took it upon herself to help the wedding party with their problem, in the way that she knew how. She spoke to her Son and explained the problem, confident in His care and His response to her. From this precious interaction, we saw how valuable her word and requests are to Him. We ask her to intercede on our behalf, before her beloved Son, that He may forgive us our sins.